Tuff tray isn't only for messy activities we have been able to use it for our Orchard Flash Cards. Placing all the cards on the table while she walks around picking them out as I say the words in English or Cantonese. 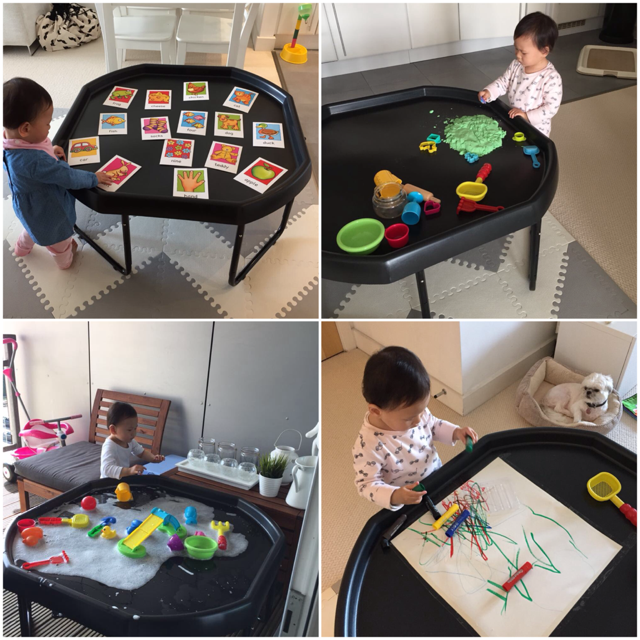 We also used the tray for water and sand play so no need to buy a separate sand / water table for us. She seems happy with water and bubbles so we will stick with the tray for now. Lastly freestyle painting with our favourite paint sticks. We absolutely love them and they make great birthday / Christmas gifts for children any age. I have even seen people use them on windows as they wipe off easily with wet wipes and so much fun. If you missed my other posts on this tuff tray activities series you can catch up below.